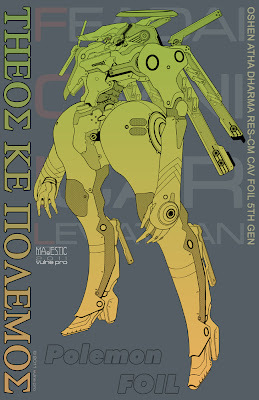 The 5th gen Oshen Atha Dharma RES-CM is FOIL design evolution at it's apex. The result of over a century of FOIL development all converging on this bold new direction to meet an even bolder and more dangerous threat than ever before. Once again we have a FOIL with the naming conventions directly influenced by the growing sendai Hindai movement. The Atha Dharma is aptly named wedding the common understanding of the term Dharma, as "duty" with the true meaning of Dharma; natural law. The Faedi face duty with the unyielding honor and Oshen has always expressed design philosophy as "in concert with the natural flow". Oshen is a company renowned for the finest taedus systems in the SOL system and their highly sought after custom combat FOILs. Any pilot skilled, enough to bond with an Oshen FOIL, as his combat frame, would be confronted with great caution on the battlefield. Oshen had always been a company manufacturing, one of a kind, custom masterworks but the situation that confronted Polemos during the "Siege of the Black Son" changed all that rather dramatically. As the looming threat, that facilitated the evolution of FOILs into the 5th generation, approached Oshen took a proactive leading role in developing the technologies that became synonymous with the 5th gen FOILs. It could be said that Oshen was responsible for the 5th gen evolution. This was the first time Oshen mass produced their products but they did so with no less emphasis on the finest quality and reliability. Although mass produced Oshen's flair for visual design still shines through as mutated deco pastiches are seen subtly throughout. One of the few mass produced FOILs by Oshen themselves (not including machines made in collaboration with other companies like Dies) the Atha Dharma is an incredibly formidable FOIL. The machine, like the Nal-Farbute (also by Oshen partnered with Dies) is equipped with a powerful RES counter measures sensor array and radome. A common feature of 5th gen FOILs are these new, enigmatic, jamming devices, but jamming what? That's for another time.